There is only one way to salvation and that is through faith in Jesus Christ. Salvation only comes through an individual believing in Christ. It is not something a father can do for his son or daughter. There is no guarantee that if one member of a family believes the rest will do so. Matthew 7:13-14; John 6:67-68; John 14:6; Acts 4:12; Ephesians 2:8. Jesus Himself indicates that the Gospel often divides families. Also, God elects individuals to salvation and the elect believe and are saved. This indicates that both ‘election and salvation’ are more individual in nature than corporate although God does have a family plan. Matthew 10:34-36; 24:24,31; Mark 13:20; Romans 9:16-18. If salvation is an individual action, how are we to understand passages in the Bible that seem to promise of household salvation? Let us consider a few examples. A promise was given to Cornelius that his household would be saved. This does not mean it applies universally to all households. It was a specific promise to a specific person at a specific time. Hearing Peter preach the Gospel Cornelius’s entire household believed and were baptized. So, they were saved was according to God’s plan of salvation, the preaching of the Gospel. They were saved because they believed not because Cornelius did. Again we see that salvation came as the result of hearing the Word of God and responding in faith which is also consistent with every other verse in the Bible concerning salvation. They were not saved because they were part of the jailers household, instead they were saved because they believed the Gospel message and responded in faith. – Individual people hear the gospel, respond in faith and are saved. God showed his keen interest in families by forming the home before he made the church. He wants that same wonderful unity, and recognition of himself, which people expect to feel in the church, to also be in the home. Many Christians have been praying for the unsaved loved ones in their families. “Does this mean they are already ALL saved?” “No, God will not violate the free will, but it means that he is going to do everything necessary to bring people to the point where it will be easy for them to make the choice to serve him. And yet they could reject his offer. If you have laid your loved ones before him in sincerity and in faith you can start praising God right now. He is on the job, and has released forces to bring about circumstances which would make it hard for these people to resist God. The Holy Spirit is preaching to them along with his angels on errands. God desires none to perish but all to be saved. He really loves people! We are glad to announce about the upcoming conference specially arranged for you all to attend. Kindly contact the below numbers and register quickly. We would like 100% participation. This is only open to select audience and those inclined to the prophetic. Only for those hungry and keen believers who want to learn and grow and step into the supernatural prophetic move of the Holy Spirit please register. God bless you all and looking forward to seeing you next month. Mark your calendars! 2. Prophetic Teaching and Bible study is held on the fourth Saturday of every month in Mumbai. 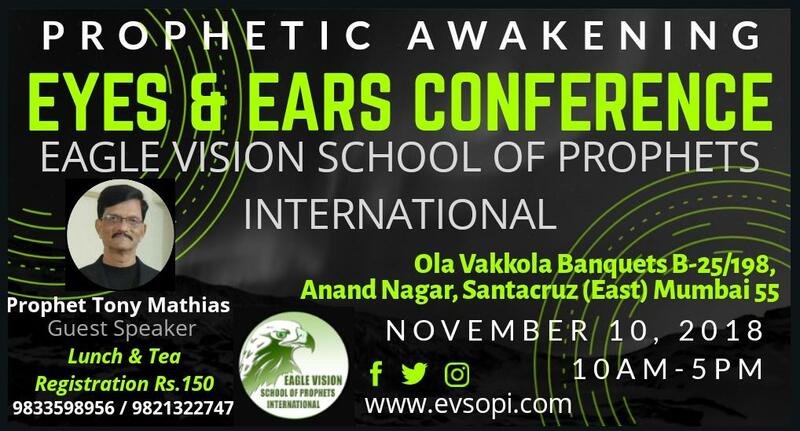 For details, drop an email to info.evsopi@gmail.com. 1. Manna Express -Bible Study by Prophet Tony Mathias at Baretto Hall on 10th March 2018. 2. Prophet Tony Mathias ministered at New Life Fellowship, Nerul – Navi Mumbai – on Sunday 4th March 2018 hosted by Pastor Daniel Kinkar and Pastor Pratibha Kinkar. 7. Prophet Tony Ministering at New Life Movement International – TMA Hall Thane – 8th APRIL 2017. Team EVSOPI invites you to visit this website from time to time. We are committed to providing regular updates for Prophetic teaching and videos on this website. Team EVSOPI encourages you to share this website with family, friends and those with a growing love and desire for the Prophetic. 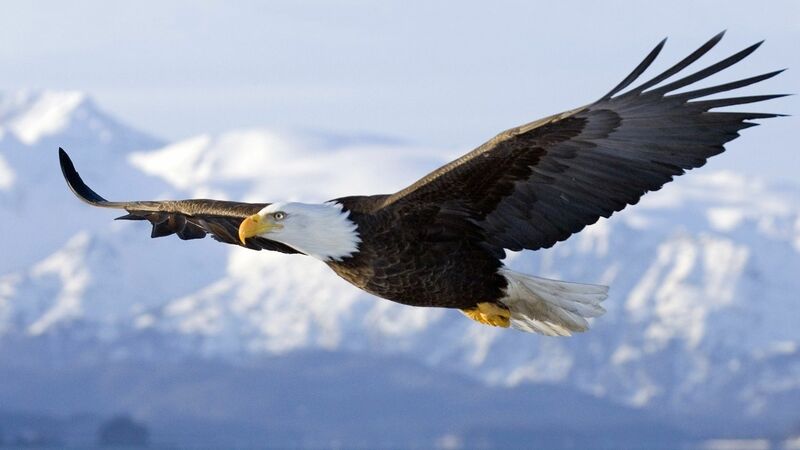 Eagle Vision School of Prophets International is a NON-PROFIT group of Christians that aims at equipping people with the knowledge of the Prophetic. This is a NON-PROFIT website created and maintained by a community of Bible believing Christians. The objective of this website is to encourage, build and teach Christians about Prophesy and the move of the Prophetic. The images used in this site have been sourced from Google. If the use of any image infringes any copyright, please inform us and we will have it removed immediately. The Prophetic teachings on this website are based on sound Biblical doctrine. If you find any of the teachings or videos posted here to be offensive or against sound Biblical doctrine, please inform us and we will have it removed immediately.